Teeth are part of the skeleton -the only part of the skeleton that you can see. Unlike some animals, human teeth are replaced only once in a lifetime. Dentists say the most important part of tooth care happens at home. 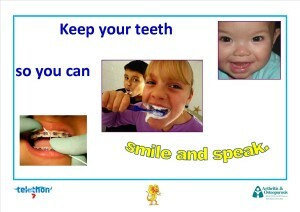 What can you do to assist your family to look after their teeth? Lead by example! Be a good role model. Brushing and flossing properly, along with regular dental check- ups, can help prevent tooth decay and gum disease. Less than 50% of Australians see a dentist every year! High fibre fruits and vegetables – high fibre foods work like a detergent in the mouth and stimulate saliva flow by requiring longer chewing time. Saliva is the mouth’s first line of defence because it neutralizes tooth-damaging acids and contains calcium and phosphates that help rebuild minerals leached away by bacterial acids. Xylitol – (a type of sugar extracted from a variety of plants) –works against the specific type of bacteria that causes tooth decay. This sugar is available from health food stores and it is contained in sugarless gum. Nuts – many nuts contain vitamins and minerals that help your teeth, such as; peanuts (calcium and vitamin D), almonds (high levels of calcium), cashews (stimulates saliva and helps clean teeth). Beef, eggs, fish, potatoes, spinach, fortified cereals, tofu, leafy green vegetables, beans, whole grains and poultry, contain the essential vitamins A, C, D and the minerals, calcium and phosphorus. Provide the correct toothpaste according to your child’s age. Beware of ‘whitening’ toothpastes as they usually contain harsh abrasives that can damage tooth enamel. If unsure, consult your dentist. It is also advised that you consult your dentist if considering an ‘at home’ whitening treatment. Schedule regular dental check- ups for your family – usually every six months. Supervise younger children to ensure they are using the correct technique and length of time – at least 2 minutes, twice per day. An egg timer is an ideal and cheap way of timing. You could play a favourite song of appropriate length. Many people choose to use an electric toothbrush: brush up and down and spend time on each tooth. Floss at least once per day. If the spaces between your teeth are small, un-waxed dental floss or dental ribbon should do the job. There are special products available to accommodate braces. Wait at least 30 minutes after eating or drinking foods with high acidity (like soft drinks, sport drinks, wine, citrus fruits and juices) before cleaning your teeth, as the acid softens tooth enamel. It is recommended that you drink water immediately after consuming high acidity food/drinks. What is the proper way to clean our teeth? When brushing your teeth it is best to place your toothbrush at a 45-degree angle to your teeth, aiming the bristles of your brush toward the gum line. Once you have the brush at the correct angle, it is important to move the toothbrush up and down only (not side to side). Do not brush too hard as this may lead to receding gums, tooth sensitivity and, over time, loose teeth. Also, do not be too mild! Also, remember to brush the roof of the mouth and the tongue. You need to be systematic – brushing all teeth in order, inside and outside – and you really should do it in front of a mirror, so you can see what you are doing. Many dentists recommend having two toothbrushes – one for morning and one for night – and replacing them regularly. Some fun activities for young children.